Montgenevre, located in the Cote D'Alpes in France, is a part of the skiing region of «Via Lattea», which includes 7 other Italian resorts: Claviere, Sansicario, Sestriere, Sous-Sauze D'Oulx, Oulx, Cesana, Pragelato. Montgenevre was founded in 1907. In 2007 the resort had celebrated its centenary, and is considered one of the first ski resorts in France. Located at an altitude of 1850 meters Montgenevre is designed primarily for family rest. Skiing there is comfortable enough for middle-level skiers and beginners, but the proximity to the Italian border and the resorts of Sestriere and Sauze D'Oulx attracts also the professional skiers to this resort. 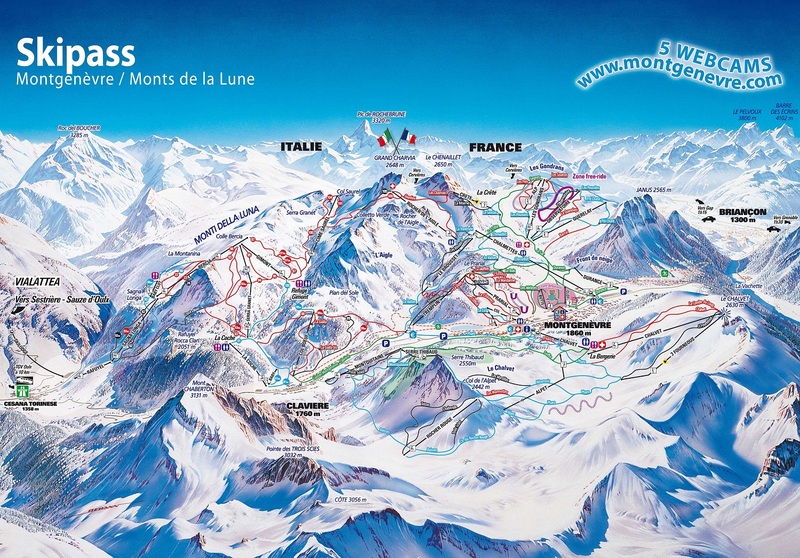 The Montgenevre ski resort is a French piece of the huge joint «Via Lattea Zone» (Milky Way). The village of Montgenevre is situated on the eponymous pass at an altitude of 1854 m. This is one of the highest passes of the Alps, opened in the winter. This place used to play an important strategic role - as in times of knights, wars and princesses, and on our "holiday" days. Through the Pass of Montgenevre passes the border between France and Italy - this is the gateway from Italy to the French Southern Alps. The lifts are located on two sides of the valley - east and west. Montgenevre was the only French resort that, along with the Italian Sestriere, Sauza D'Oulx and San Sicario, hosted the Alpine events of the Olympic and Paralympic Games of Turin 2006. The resort offers two ski passes to choose from - the Montgenevre - Claviere home zone or the entire Via Lattea area. These transfer times are approximate only. Planning your vacation in Montgenevre and thinking on transfer expenses, you can always count on the most dynamic and flexible pricing system here, in Alps2Alps. We are a team of professionals in our field of transfer services and we do everything possible to low the transfer costs for our customers. That's why we will take into account all details of your future trip. And don’t doubt – you will be provided with the most beneficial transfer price, at any time of the season. We promise to deliver you to Montgenevre on the highest level of reliability and at the lowest possible price. All our clients already know that we never overstate our prices at any time or for any reason. Besides, Alps2Alps always offers you very significant discounts for the transfer on mid-week days and at the low season. If you are looking for the best transfer prices, be aware that travelling outside the peak season or in the middle of the week will let you save on the services as much as possible. Our transfers from Monday to Friday usually are with a discount of up to 60% than on weekends. Notice also, that your final transfer quote will be dependent on such things as availability of the car, the transfer schedule, the use of the vehicle, tolls and parking fees at the airport. If you have some more requests, or you want to clarify any information, for example, you will be travelling in a large group, please contact us directly so that we can discuss your future trip. Ski holidays in Montgenevre perhaps is the best choice for skiing among all the resorts in the Southern Alps. A large number of open wide routes, both simple and gentle, and really steep and direct - for experienced skiers. The skiing area is not that extensive, but it will surely satisfy for those who like to ski on steep slopes. For the most demanding skiers who did not have enough variety here, we advise to move further, across the border of France and Italy - the Montgenevre resort is connected by lifts with other Italian resorts. There are offered varied accommodation options in Montgenevre, everywhere there is direct access to the ski lifts. The resort does not belong to the category of fashionable, everything is relatively simple but comfortable. This is an excellent choice for families with children. And thanks to a large number of sunny days, you and your kids will be charged with sunlight and energy for the rest of the winter. If you want to be ensured of an ideal start of your alpine ski holiday, let Alps2Alps make a little help for you. As we are committed to providing high-quality transfer services and the lowest prices. When it comes to maximum reliability and punctuality, you will not find a better solution than Alps2Alps. In order to take a benefit of the most beneficial transfer cost, we advise our clients always make the booking in advance. Don’t forget to contact our customer service team, if you need some more information about alpine transfer services. Just make a call to our managers, book a transfer to Montgenevre and wait tranquilly for your unforgettable ski holiday. Let your holiday start the best way to Alps2Alps!